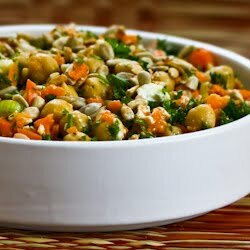 (Updated and added to Recipe Favorites July 2010) Nearly three years ago I made this salad with carrots, chickpeas, and parsley, tossed with a lemon-cumin vinaigrette and then jazzed up a bit with some feta and a few sunflower seeds. I didn’t realize it until I looked at the post, but this is another recipe adapted from Fine Cooking, although I changed it up a bit with the lemon-cumin vinaigrette. Salads like this, with some protein from the beans and plenty of lemon flavor, are just what I like to eat for lunch when it’s hot outside and you don’t feel like cooking, or this would make a great side dish salad if you’re cooking something on the grill. 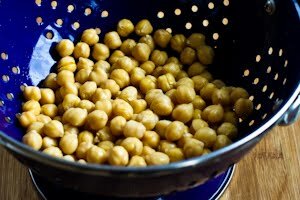 Drain chickpeas into a colander placed in the sink and rinse until no more foam appears, then let drain and pat dry with paper towels if needed. I used a food processor to coarsely chop the carrots, but when I made this for friends recently, they suggested cutting the carrots in larger pieces, or even using the pre-shredded carrots I used recently for the Spice Shredded Carrot Salad, so take your choice on that. Wash and dry parsley, then chop enough to make 1 cup chopped parsley. Stir together the lemon juice, cumin, salt, pepper, and Aleppo pepper (if using), then whisk in the olive oil. If desired, crumble 1/2 cup Feta cheese and gently stir in to salad. Top with toasted sunflower seeds or pine nuts. Put chickpeas in colander and rinse until no foam appears, then drain well and blot dry with paper towels. Peel 2-3 carrots, cut each into several pieces, then put in food processor with steel blade and pulse until carrots are coarsely chopped. 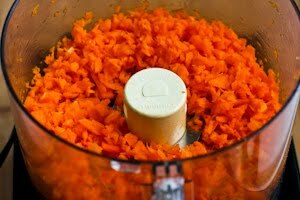 (Carrots can also be chopped by hand or you can use pre-shredded carrots if you prefer.) 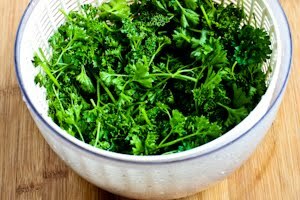 Wash parsley, spin or pat dry, then chop coarsely with food processor or chef’s knife. 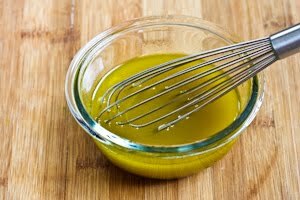 Mix lemon juice, cumin, salt, pepper, and Aleppo Pepper (if using) in small bowl, then whisk in the olive oil. 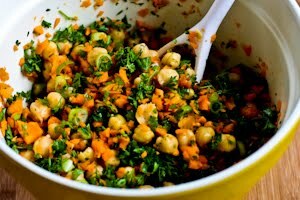 Taste dressing to see if you want more lemon or cumin.Combine chickpeas, carrots, parsley, and scallions in large bowl. Mix dressing into salad. (You may not need it all if you prefer your salads on the dry side.) Gently fold in feta cheese if using. 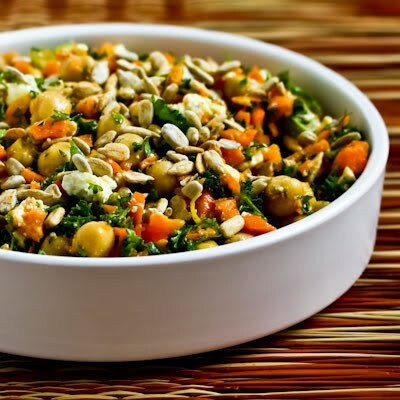 Serve each salad with a sprinkling of sunflower seeds or toasted pine nuts. This will keep in the fridge for a day or so, but add the Feta and nuts when serving if you’re not going to eat it all at once. Carrots aren’t allowed for phase one, so this salad would be phase 2 or 3 of the South Beach Diet. (I previously had this labeled wrong; sorry for that mistake.) I think this would taste great with Grilled Spicy Tuna or Greek Salmon Cooked in a Grill Pan. hi kalyn! i know i’ve made this before but have a silly question – do you use a 14/15 oz can of chickpeas, or a larger 28ish oz can? thanks! Definitely the 15 oz. can is what I used! I will edit to clarify. Rhianon, I am intrigued. Will definitely try that when I have garden carrots. I have been making this recipe from your blog for several years. Thanks for sharing! We love it. I noticed no one has ever suggested my favorite variation – carrot greens instead of parsley. Carrot greens are mellow and carroty. I actually don't like the salad nearly as much as when I have to use parsley – I won't make it anymore without carrot greens! So glad you like it; this is one of my favorites. 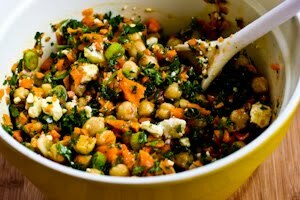 Absolutly delicious combo, so healthy and colorful.I am a huge fan of veggie salad..Going to make this soon ! Carrie, so glad you liked it. I don't think I would leave out anything, but the Feta and sunflower seeds are probably the most optional. I'd want at least one or the other though. Kalyn, I was skeptical of the recipe – I kept wanting to add feta cheese and cucumbers. We loved it as you wrote it. Thank you very much. A great source of real food, simple to prepare (even out of season). Any thoughts on must-includes vs. nice-to-haves? Thanks Amy! So glad you liked it, and I personally love this salad too. I clicked on this recipe at the bottom of today's blog and so glad I did! I absolutely love the bright, clean flavors and texture. I will make this again and again, and I'm looking forward to eating the rest of it tomorrow. Thank you so much for all you do! I love your site. Glad you liked it, and actually I think pumpkin seeds sound lovely in this. OMG, this is delicious!!! I knew I'd love it the moment I read it :O) I used pumpkin seeds because it was what I had on hand. I'm making it again (with sunflower seeds this time) this weekend to take to a Middle Eastern themed pot luck dinner. Dylan, I HATE IT when I make mistakes like this, but you're right, carrots are not allowed for phase one, so this salad should be phase 2 or 3 (will fix it right now.) There are lots of phase one salads with beans though, check out Phase One Salad Recipes. Thanks for letting me know about this, and good luck! Luana, I like the idea of using cucumbers for the crunch! Glad you liked it. I made this for lunch today and it was really good. Didn't have pine nuts or sunflower seeds, so I added in a few peeled chopped Persian cucumbers. They added crunch and a good flavor. The salad looks fantastic because it's favorite. Looks great and sounds wonderful. Hope to make it soon! Karen, so glad to hear you liked it! I made this salad for lunch today – delicious! This is a wonderful flavor combination…love the lemon dressing with the cumin. You have so many wonderful salad recipes and I love to make them for my work lunches. Kalyn, you always make the best salads, full of nutrients and flavor! I love the cumin in there. Great colors too! It's nice to see that people are enjoying the updated version of this recipe. I agree, Fine Cooking Magazine is always a source of good cooking ideas. So colorful and fresh. Love your combination of flavors. very healthy spread. Love to be here. It's summer on a plate. I'm obsessed with feta, parsley, and cumin. Must be my lebanese heritage! Suits me that you were “stuck” with carrots last year! I live in Paris and I bought at my local market four different types of winter carrots. I have many options to prepare them! THank you! I love carrots and always have them in the fridge! What an interesting combination this is. This is going to be a great summer salad – I’m guessing it will keep for a day or two. Sharmi, thanks. I have heard of chaat, but didn’t know it was a combination of those ingredients. Love learning more about Indian food. Lydia, cumin is just the greatest with carrots. Tanna, your variation sounds great. Bradley, me too on the garbanzo beans! Anh, I bet you’d like it. Susanna, hi. Thanks for the link. Kalyn, hi!!! I have added your blog to my list of delish-ious blogs!!! here’s to more good food!!!!!!!!!!!! I can already imagine the taste if this salad! Must be beautiful! The salad looks fantastic, I am a huge fan of garbanzo beans and the salad has a nice middle eastern feel to it. There’s a package of orzo, baby garbanzo beans and red quinoa that would really do a salad like this charm! Yes, don’t we all get stuck on a veggie, I think carrot is perfect! There’s something in the air — I posted about cumin this morning! Cumin and carrots are a lovely combination — both sweet, but the cumin brings warmth. hi Kalyn, the salad looks so colorful and nutritious!! I like garbanzo, onion, parsley, lemon juice and onion combi. we call it chaat in India. nice recipe.